In spite of lingering headwinds and a fresh set of challenges, the national economy continued to demonstrate overall moderate expansion through the first quarter of 2015, but several indicators suggest a slightly weaker pace of growth going forward. Eight of twelve Federal Reserve Districts, including the Minneapolis District, reported modest or moderate growth, with the remaining four Districts reporting slightly expanding or steady conditions. Growth has been spurred by improvements in the labor market and healthy consumer confidence. Non-farm employment at the national level increased by 2.3% year-over-year in March of 2015 on the net addition of nearly 600,000 jobs in the first three months of 2015. Employment gains have been led by rising payroll figures within the goods-producing sectors, though increasing headcounts were also noted across the service-producing and government sectors. Meanwhile, consumer confidence levels reached an eight-year high in the first quarter of 2015, peaking at 98.1 in January of 2015, as retail sales figures remained solid. 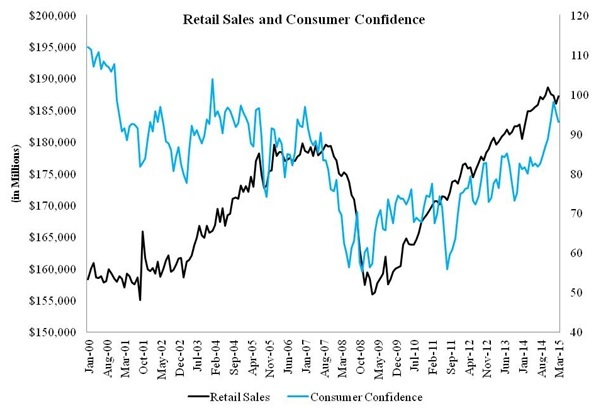 The following chart presents national retail sales figures and the Consumer Confidence Index through the first quarter of 2015. Although the national economy demonstrated overall progress in through the first three months of 2015, lingering global economic headwinds and setbacks resulting from falling energy prices held back further expansion. Several leading indicators painted a more pessimistic economic outlook and point toward a slightly milder pace of growth ahead. The NFIB Small Business Optimism Index dropped approximately 5.1% at the close of the quarter after rising to 100.4 in December of 2014. The Institute for Supply Management’s ISM Index also decreased through the first three months of 2015 and fell for the sixth consecutive month in March. In addition, the Manufacturers Alliance/MAPI Composite Business Outlook Index also demonstrated some weakness. While these indicators suggest a milder pace of growth going forward, it is important to note the NFIB Index reading of 95.2 in April of 2015 remains up compared to the year prior, and 15 of the 18 manufacturing industries reported growth in the latest ISM Report On Business. Moreover, the MAPI Foundation Business Outlook in April of 2015 reported healthy capacity utilization and declining inventories, which lessens the risk of oversupply. Residential market: The national real estate market continued on an upward trend in the first quarter of 2015. Conditions in the for-sale residential real estate market remain steady to slightly improving, but the declining availability of desirable inventory and harsh winter weather in some regions, notably the Northeast region, held back further improvements. Commercial market: Fundamentals in the national multifamily market remained relatively strong across all regions, while most major markets noted improvements in the office, retail, and industrial sectors. Improving fundamentals, attractive financing opportunities, and superior returns compared to alternative investments continue to attract capital into the commercial real estate market, with investors demonstrating a clear preference for properties in markets with diverse economies and technology hubs. Foreign investors are playing a significant role in driving investment activity, but domestic institutions also have demonstrated a resilient appetite for commercial real estate assets. The anticipation of rising interest rates remains one of the major concerns in the near term, but the outlook for the commercial real estate market remains optimistic, as user demand is projected to remain positive and facilitate healthy occupancy levels to further drive rent growth. Similar to conditions at the national level, the Minnesota economy demonstrated moderate growth in the first three months of 2015 despite recording somewhat mixed results during this period. Target Corporation announced layoffs of 1,700 in March of 2015, while three iron ore facilities in northern Minnesota idled or reduced production in response to lower demand for steel, resulting in more than 1,100 layoffs. In addition, turkey producers in the State were hit by an extremely lethal strain of bird flu, which resulted in layoffs. Overall non-farm employment at the statewide level increased by 1.80% year-over-year in March of 2015 on the net addition of approximately 49,400 jobs. The first three months of 2015 saw payroll figures statewide increase by 13,400. More impressive, the state of Minnesota recaptured all of the jobs lost from the recent recession in the first quarter of 2013, a feat that some states have yet to accomplish as of the first quarter of 2015. Employment growth in the state of Minnesota during the first quarter of 2015 was led by the education/health services and leisure/hospitality sectors, which accounted for over 90.0% of all new jobs added between December of 2014 and March of 2015. 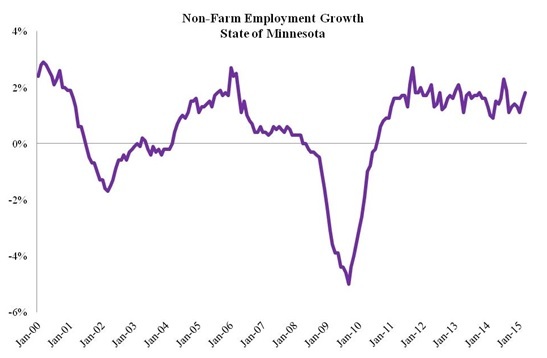 The following chart presents year-over-year non-farm employment growth in Minnesota. The unemployment rate in the state of Minnesota decreased to 4.50% in March of 2015, down 80 basis points from 5.30% reported 12 months prior, though up from the 4.4% posted in February of 2015. The unemployment rate in the state of Minnesota continues to track below the national level, which reported an unemployment rate of 5.60% in March of 2015. Labor markets in most Minnesota metropolitan areas remain relatively tight; the unemployment rate remains lowest the Mankato area (3.40%), followed by the Twin Cities (4.00%), Rochester (4.20%), St. Cloud (4.80%), and Duluth (5.60%). 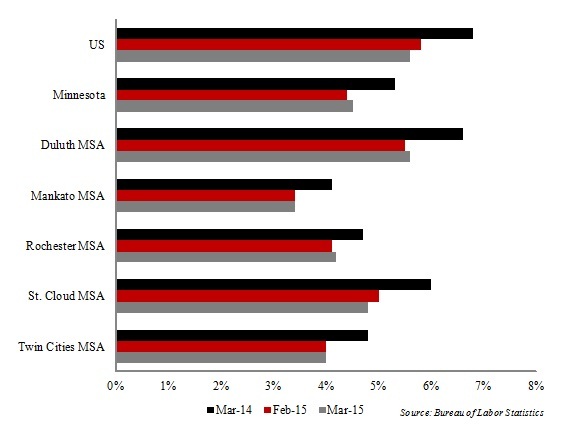 The following chart presents unemployment rates for regional MSA markets, state of Minnesota, and the United States. Supported by a diverse and expanding economic base, conditions in both the residential and commercial real estate markets at the statewide level remain healthy. Residential permitting activity through the first quarter of 2015 in the state of Minnesota increased by 46.7% compared to the first three months of 2014, while the value of residential permits increased by just over 40.0% during this same period. In addition to new residential construction activity, the for-sale residential market continues to post rising median home sale prices and a stronger pace of sales velocity. Multifamily residential construction activity remains relatively strong in the Twin Cities metropolitan area, particularly within the region’s core, but multifamily developers are also active in several outstate Minnesota markets. Healthy occupancy levels and positive absorption are supporting rent growth in the Twin Cities apartment market, but conditions are also favorable in the Mankato, St. Cloud, and Rochester markets. Commercial real estate markets continued to note progress in the first three months of 2015, as momentum in the industrial sector remains strong and the pace of improvements in the office and retail sectors accelerates. In turn, developers are responding to capitalize on favorable market conditions and attractive financing opportunities, resulting in a wider commercial construction pipeline. Given the dearth of new residential and commercial construction deliveries from 2009 to late 2011, new construction levels remain reasonable compared to historical norms, and as long as the economy continues to expand at a modest to moderate pace, the runway for value creation in the market appears relatively wide and long. Investors are optimistic on the outlook for real estate in the Twin Cities metropolitan area and throughout much of the state of Minnesota. Relatively robust investment activity continued through the first quarter of 2015, as national institutional buyers became more aggressive in the market. In February, Carey Watermark Investors, a New York-based REIT formed to make investments in the lodging and lodging-related sectors, purchased the 214-room Minneapolis Westin for $66.4 million or approximately $310,280 per key. The deal for the Minneapolis Westin surpassed the previous Minneapolis record of $257,000 per key paid by Loews in the $65 million sale of the Graves 601, which closed in late 2014. In one of the largest industrial transactions during the first quarter of 2015, IRET announced a portfolio sale in March, which included four office showroom properties in the Twin Cities. The four-property portfolio sold for $26.6 million or approximately $72.00 per square foot of total gross building area. The four-property portfolio included Burnsville Bluffs II, a 45,019-square-foot asset in Burnsville; Whitewater Plaza, a 61,138-square-foot asset in Minnetonka; Southeast Tech Center, a 58,300-square-foot asset in Eagan; and Plymouth Tech I-V, representing a total of 205,494 square feet in Plymouth. Investment activity in the office, retail, and multifamily markets also remained healthy in the first three months of 2015. In March, Franklin Street Properties sold the Eden Bluff Corporate Center to Dougherty Real Estate Equity Advisors, LLC for $28 million or $182.97 per square foot. The property, which is leased by C.H. Robinson Worldwide, Inc. through June of 2021, was purchased by Franklin Street in June of 2009 for approximately $22.57 million, indicating an annual rate of price appreciation of nearly 4.0%. Notable activity in the multifamily sector included the sale of 222 Hennepin in March of 2015 to Weidner Apartment Homes, but healthy interest from investors and investment activity in the multifamily sector was also reported in several outstate markets. A private Twin Cities-based investor purchased two apartment assets in the Mankato market during the first quarter of 2015. In February of 2015, the 132-unit Sunrise Village Apartments in North Mankato, located in close proximity to South Central Technical College, sold for $6.15 million or approximately $46,591 per unit, and in March of 2015, the same private investor closed on the Woodside Apartments, located near the River Hills Mall. The 101-unit Woodside Apartment complex sold for $11.66 million or approximately $115,446 per unit. In the retail sector, an Illinois-based firm, Pinetree Commercial Realty, purchased the Village of Blaine for $38.3 million or approximately $173.00 per square foot. Located in the eastern portion of Blaine, near the intersection of Lexington Avenue and Interstate 35W, the Cub Foods-anchored center sold at relatively healthy per pound price, considering that Wal-Mart has announced plans to relocate from existing space just east of the center. Demonstrating that retailers remain relatively optimistic throughout the state, Fleet Farm purchased approximately 39 acres of land in Hermantown for $10.255 million, or roughly $6.00 per square foot of land area, in two transactions to accommodate the development of a new 183,000-square-foot store within the Hermantown Marketplace. The retailer also opened an 183,600-square-foot store, along Highway 22 in Mankato, during the first quarter of 2015. Data referenced in this report was current as of May 5, 2015, and includes preliminary employment numbers as reported by the Bureau of Labor Statistics, which are subject to revision.